At the recent Miami Boat Show Canados introduced its first "open" 90' yacht designed by the Luiz De Basto Designs studio, featuring very interesting tech - styling solutions. 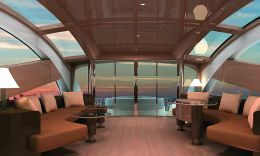 Interior lighting is provided by giant glass window areas that recess where possible in the way there are huge windows running along the superstructure stiffeners on both sides of the forward sundeck and along its the sides in addition to traditional glass windshield and deck house side windows. This technical solution, so difficult to be realized, results at the same time in an impressive aesthetic - styling look especially to people, who inside the deck house are drinking something while comfy sitting in the saloon and wondering in full view the sea or the star sky under way. Interior is wholly fine - finished and realized with high quality materials. The deck house features amidships a saloon with a dining area separated from the forward wheelhouse by a multi - media console with a disappearing LCD TV. The pilot area features a centreline bridge with two ergonomic seatings; still on it, outside in the cockpit, there is a huge area for sunbathing and forward of it a dinette with a crystal plated table with a disappearing electro - hydraulic movement system. 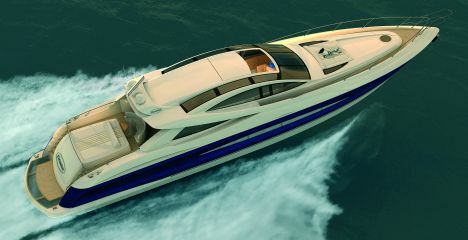 The giant aft platform is part covered with teak part with crystal recalling this Open's prevailing style. The transom accesses to the garage made for tenders with enough space to nestle a craft and an aqua-scooter. A further sunpad, recessed in the forward area of the superstructure, is available. The lower deck is divided into two quarters each with separate access for privacy. Owner's and guest areas run from amidships to forward end and are entered by means of a ladder located in the wheelhouse. This area features a full - beamed owner's suite with central double bed, dressing room, relax corner, office, and huge bathroom with separate shower stall. The guests have two cabins with in - line twin beds and a forward VIP suite, each with private bathroom. The crew's quarter can be entered from the saloon/dining area and features a giant liveable galley plus two cabins each with private bathroom. According to what this great appreciated Italian yard has officially declared, a pairing of 2.030hp MTU engines, in combination with Arneson surface drives, provide a max speed of 45 knots and a cruising speed of 37. For further information please contact: Canados, I - 00121 Rome, Via dell'Idroscalo 182; phone number: +39 (0)6 56339732; fax: +39 (0)6 56037581; web site: www.canados.com.